The popularity of laser induced breakdown spectroscopy (LIBS) has been rapidly growing since its introduction in the 1960s, and is now used is industrial, military, scientific, and medical applications. Nowadays LIBS is rapidly becoming an indispensable tool for elemental analysis and is generally viewed as a complementary technique to other elemental methods such as mass spectrometry. Within the medical field, LIBS can be used for analyzing hard/calcified tissues, soft tissues, biomedical specimens; as well as disease detection and even during laser-guided surgery. In this application note, we will explore these uses of LIBS in the medical/biomedical application space, by taking a look at some of the common applications as well as both laser and system requirements. It is important to note that this is by no means a comprehensive review of the subject, this application note is intended rather to provide the reader with a brief “taste” of what is going on in the broader field of study. Before we can dive into biomedical applications though, we must first take a step back and establish a basic understanding of LIBS as a technique in general. As the name implies LIBS utilizes a focused laser beam to breakdown or ablate the sample. In this process, a microscopic portion of the sample is vaporized causing a momentary plasma to be formed. This causes all of the ionized elements in the plasma plume to emit light corresponding to their unique atomic energy levels. By collecting the light emitted from the induced plasma plume and directing into a spectrometer the measured lines can then be correlated with the presence and concentrations of the samples elemental structure. While the physical process is quite different it is often helpful to think of LIBS, as an optical analog to mass spectrometry. From this description above it should be obvious that the laser source used must have a sufficiently large energy density to ablate the sample in as short a time possible. 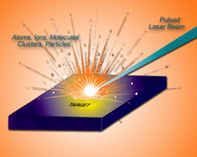 As a result, the fast majority of LIBS lasers are q-switched diode pumped solid state (DPSS) lasers, which typically provide millijoules of energy in a nanosecond to picosecond pulse duration. When focused down to a small spot, this allows the laser to quickly ablate the sample, and trigger the spectrometer to immediately start the acquisition process to collect the atomic emissions from the short-lived plasma plume. Even though this application note does not intend to analysis the spectrometer requirements, it is important to point out that the ability to accurately trigger the spectrometer to the laser pulse is critical for the success of this application. If the spectrometer electronics are too slow in response to the trigger pulse, or there is to much timing jitter the spectrometer acquisition will lag behind the plasma plume and miss the spectral emission. 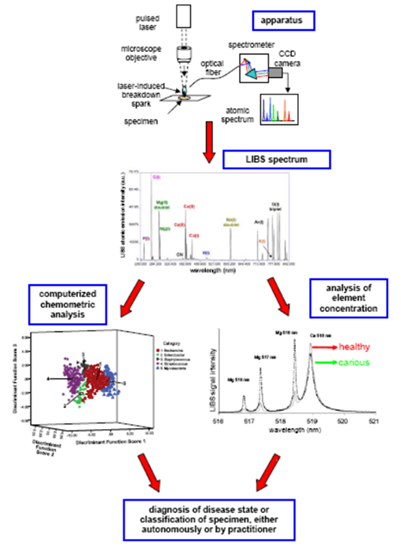 In biomedical applications (and many other) the collected LIBS spectra are then analyzed in one of two primary methods depending on the intended goal, identification or quantification. The below image was taken from Steven J. Rehse’s “Biomedical Applications of LIBS,” does an excellent job of visualizing the workflow of these two processes. In one case of identification, the signal is either correlated against a library of known plasma emission spectra to identify an unknown material or it is fed into a multivariant classification algorithm verify the identity of a “known” sample. In quantization, the measured spectrum is compared using a regression model (either univariant or multivariant) developed from known concentrations in order to identify how much a particular element is present. Based on this information a diagnosis can then be given for a wide variety of diseases and deficiencies in the human body. With the use of these two fairly straightforward processing steps LIBS can be used to identify a wide range of medical conditions. By looking at elemental concentrations, medical professionals can use LIBS spectra to measure the concentration of or changes in the concentration of a specific element or elements present in a biomedical specimen to diagnose, monitor, or predict a disease state. One common example of this is to look at the intensity of calcium emission to differentiate between healthy from carious dental tissue. When using classification or correlation techniques the LIBS spectra serve as an elemental fingerprint (which is analogues to the molecular fingerprint often discussed in Raman spectroscopy) provides the ability to diagnose, monitor, or predict a disease state. For diagnostics, the exact concentrations of each element are not important and allowing for assay free measurement. One good example of LIBS being used in medical diagnostics is for discriminating between pathogenic from non-pathogenic bacteria. One of the newest application of LIBS in the medical field is for laser guided surgery. In this case, the plasma emission plume from the cutting or ablating laser can be collected by a second fiber optic and analyzed to verify the last surgeon is only removing the damaged tissue. While this procedure has been experimentally demonstrated, there are still technical issues that need to be resolved before endoscopes with LIBS capabilities become commonplace. 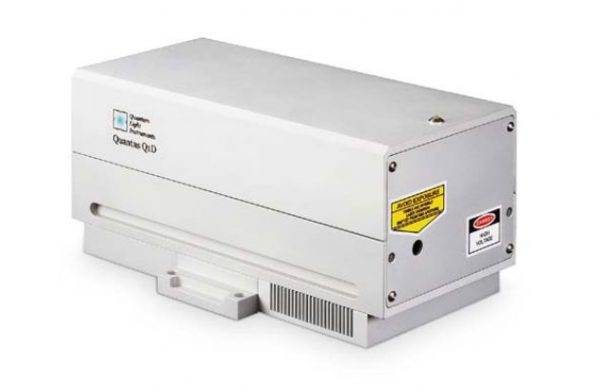 Here at RPMC Lasers, we offer the Quantas laser series, by Quantum Light Instruments, which is an ideal laser source for biomedical LIBS applications. The Quantas is a compact, air-cooled, q-switched laser designed to produce low pulse repetition rates and high peak power pulses, with a pulse energy of 10mJ and a pulse repetition rate of 10Hz. To produce such high pulse energy the Quantas series employs MOPA (Master Oscillator/Power Amplifier) architecture to produce high pulse energies while maintaining beam quality and low divergence. Importantly for LIBS application, the laser pulsing can be externally triggered from delay generator, allowing operation in single-shot or variable pulse repetition modes.